PREFER IF YOU WOULD PLEASE BOOK BETWEEN SATURDAY TO SATURDAY AS MOST GUESTS BOOK THEN BECAUSE OF THEIR WORK SCHEDULE OTHERWISE YOU'RE BREAKING UP TWO WEEKS AND THE BALANCE OF THE TWO WEEKS IS DIFFICULT TO BOOK. THANK YOU. Vacation paradise at its finest !!!! Weekly, monthly rates. No Smoking inside. Check in 2 pm. Check out 10 am. Your home away from home except you are on the beach. It has everything you need: fully equipped kitchen, 3 flat screen tvs, internet, blue ray dvds, beach chairs. umbrellas, towels & beach accessories/toys so you do have to bring all that stuff with you. Dec 2018 just bought new king bed for front bedroom. If this is rented, I own another beautiful condo 25 miles north on the intracoastal with a boat slip, pool and private & public beach 1 mile from condo. To maintain the beauty of Sandy Shores, Feb 21st, 2018 we started construction repairs on the outside of the building which can be very noisy Monday to Friday 8:30 am to 4:00 pm and they break for lunch for about an hour. They will also be working on the hallway and condo balconies at some time during this construction, at which time the balcony will be closed. Completion date is approximately the end April 2019. The pool will remain open and there is always our beautiful beach to enjoy. During this time will be one parking space per condo, as it always has been. Just wanted to share this good news with you, but you will probably be enjoying the beach or exploring the area during the day.. Cancellation: once the reservation is made if cancelled more than 60 days before arrival, the only fee will be $300.00. Any cancellation received 60 days and up to arrival it is 100% nonrefundable. After May 1st no pets allowed unless booked prior to May 1 2019. Didn't start renting my property until 2011. I live just 1 mile away on intracoastal property for our boat. Just looking for someone to enjoy & preserve my beach condo getaway as much as I do! It is so heavenly here. I stay here whenever I get the opportunity. I decorated the condo in the beach theme!! Paradise on the gulf, enjoying the pool/ barbeque area that faces the beach/gulf. My condo is totally furnishedl so you don't have to lug as much in your car or on the plane. Past guests have said it is home away from home but on the beach. Full bathrooms with tub & shower off of each bedroom. Builder put 2 bedrooms on the side. Mine faces north which is a better view than the south. You have a partial view from back bedroom and balcony. Sandy Shores is gulf front. The pool and bar b que area is the width of the building and faces the gulf. I elevator & 2 sets stairs. only 11 condos per floor. 1st floor parking/pool area facing beach. I am on 2nd floor . Beach toys for all ages from baby to adult with beach chairs, umbrella and portable gazebo. Partial Gulf/beach view from bedroom/balcony. except for getting into tubs in bathrooms. Beach front, Swimming Pool, Boating, fishing, watersports. We had a wonderful stay at our condo! We had everything we needed either right there or within walking distance. Groceries available within a short drive. Lots to see and do all right there. Great beach access and clean pool. Our kids 7 and 14 had a blast! Thanks Crystal! Crystal was was very nice and accommodating. She was easy to reach when we had a question. Beautiful beach and much to see and do across the street. I only gave it 4 stars because of the construction which we knew about when we booked but that made it not “perfect”. For the price I paid, I expected the condominium to be tastefully decorated, updated and clean. Although the location was right across from St. John's Pass and on the beach, we did not find the condominium to be what we expected for the price. Beautiful condo.....we had a great time! a comfortable, well-appointed condo steps from a pool and beach, wonderful! And the owner Crystal McGowan could not have more kind, responsive and helpful. It was a lovely 3 weeks, so quickly over, alas. Highly recommend it! The location was very convenient to everything we needed and wanted to do. Crystal was awesome to deal with and provided us with everything we needed. The condo was very clean and had all of the necessities you could want. 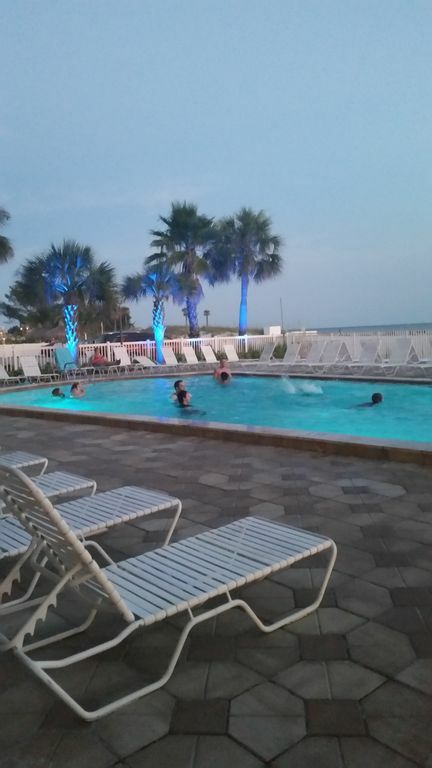 Beachfront Condo across from Famous Johns Pass that offer fishing, boating, watersports= parasailing, jetskis, dolphin watching, restaurants, shopping, clubs, sports bar, day/night cruises. In keeping with the beauty of Sandy shores, we have started maintenance construction Feb 19 2018 until appx the end of April 2019 on the outside of the building M-F 830 am. The pool will be open and you can step from the pool onto the beach. The condo balconies will be closed at some point when they change the flooring and install new sliding doors. Most everyone is spending their time on the beach during the day and this is not a problem, but want to make you aware of it. $300 reservation deposit is required at time of booking nonrefundable. Add 13% Fl Hospitality tax and $100 cleaning fee per rental period. Payments by credit card will incur a 3% (5% international) fee, so please pay with E-CHECK because that is FREE. If you bring a pet you are agreeing to pay $100 per pet.